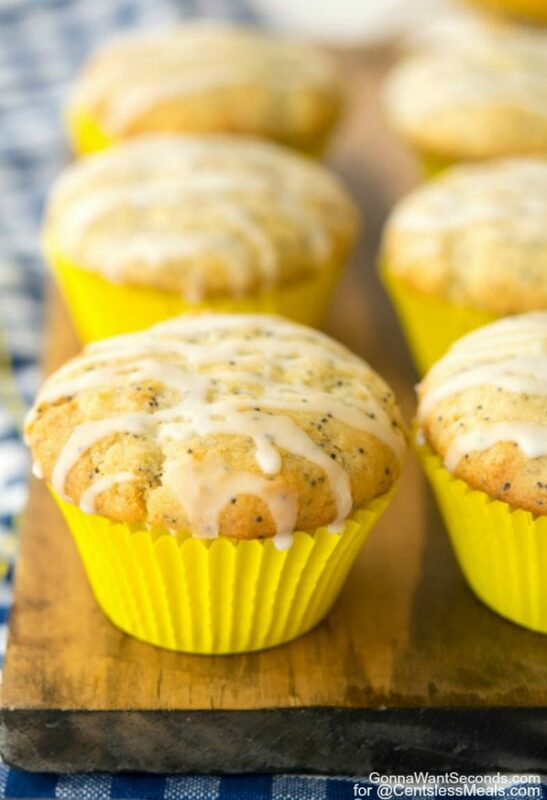 These easy to make Lemon Poppy Seed Muffins bake up moist and tender and are drizzled with a lovely lemon glaze. 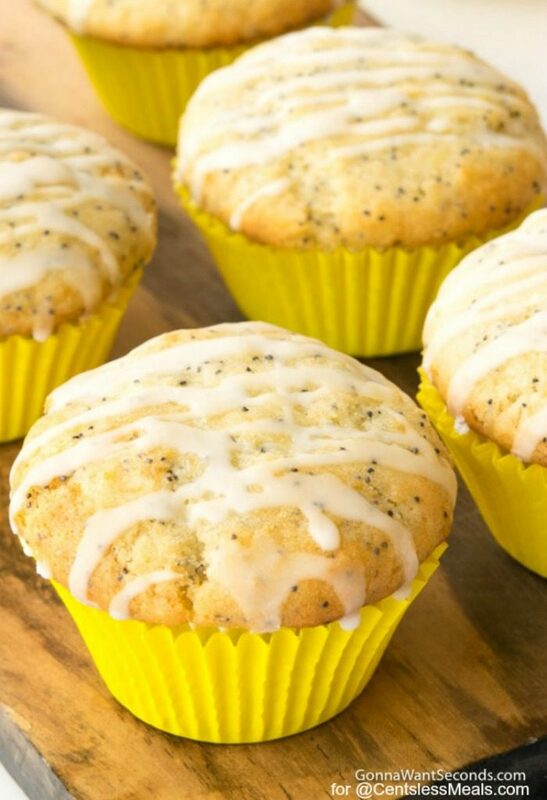 You know, if that wicked witch had skipped the red flowers and tried to distract Dorothy with these Lemon Poppy Seed Muffins, she’d have forgotten all about that dumb wizard and still be blissfully skipping along the yellow brick road. They’re moist and rich, with a delicate crunch from all the seeds, and the tops are practically glistening from the sweet and tangy glaze drizzled on top. 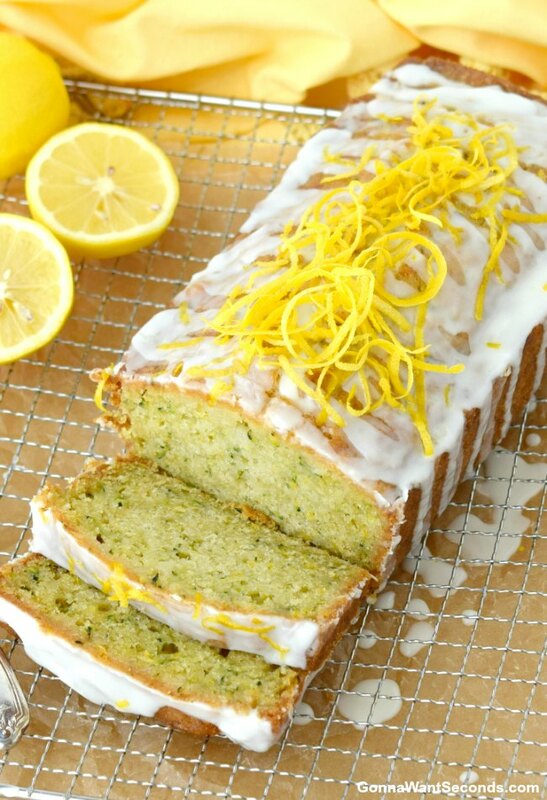 A glorious lemony sunrise baked in a muffin tin, that’s what’s for breakfast . . . or a mid-afternoon snack . . . or even dessert. 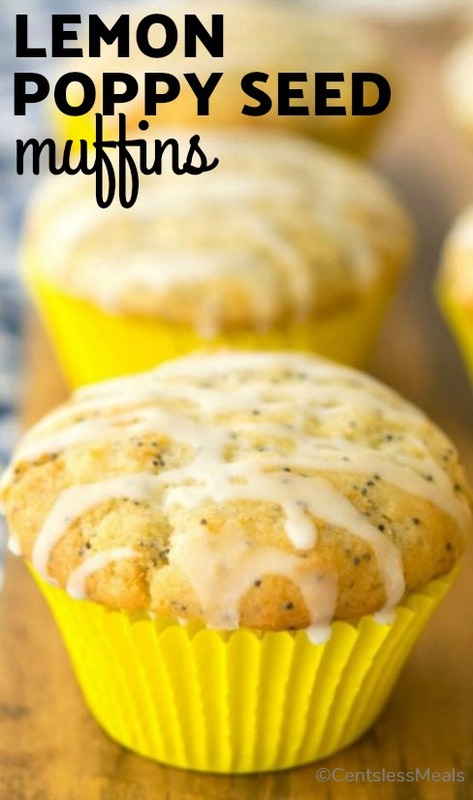 These Lemon Poppy Seed Muffins will definitely meet all your needs for a sweet, after-dinner treat, but they really are muffins, not cupcakes, and there is a difference between the two. They both have similar ingredients – flour, sugar, eggs, and some kind of fat, but the method of preparation puts them in two separate categories. Cupcakes usually start with butter, muffins usually start with oil. Cupcakes spend time under a mixer’s beaters, muffins are minimally mixed (the batter may even be lumpy when it’s baking time). Cupcakes have frosting, muffins have mix-ins. Cupcakes = smaller crumb, sweeter on the palate. Muffins = bigger crumb, more complex texture. Admittedly, both are delicious, but I can eat the latter with my morning cup of coffee without having to justify myself to the dessert police. Cupcakes? Not so much. 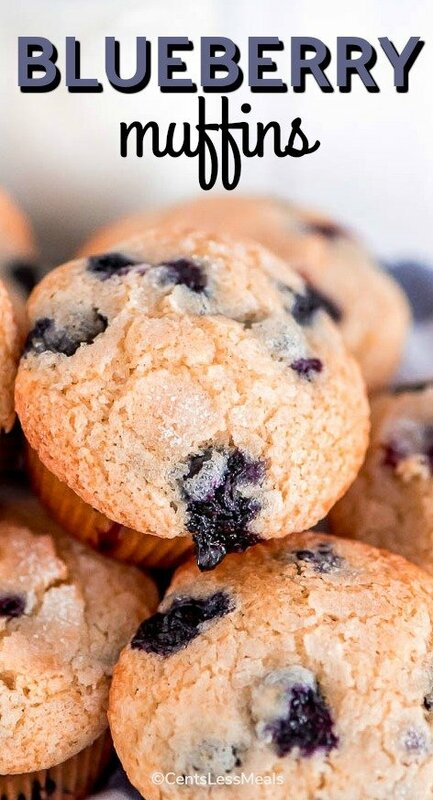 Unlike cupcakes, there’s no butter/sugar creaming step, so muffin recipes typically have more leavening ingredients like baking soda or powder to make up for the lack of air that gets whipped into a cupcake (or cake) batter. They’re also called “quick breads” for a reason – muffin recipes come together more quickly than their frosted siblings. 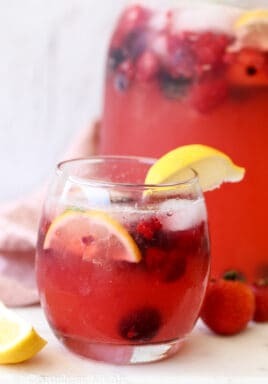 For this particular recipe, all you need to do is mix your dry ingredients in one bowl, your wet ingredients in another, then combine the two. Easy peasy! Poppy seeds are a funny little thing . . . so little, in fact, there are about 900,000 of them to a pound! 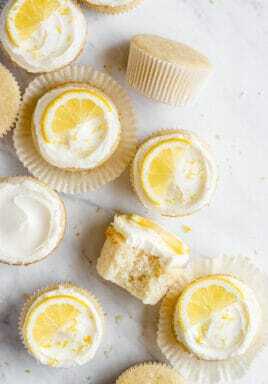 Because they are so tiny, it’s surprising they add not only a little texture (and contrasting flecks of color) but also an unmistakable nutty, almost fruity quality that manages to stand out even with all the lemon going on in this recipe. 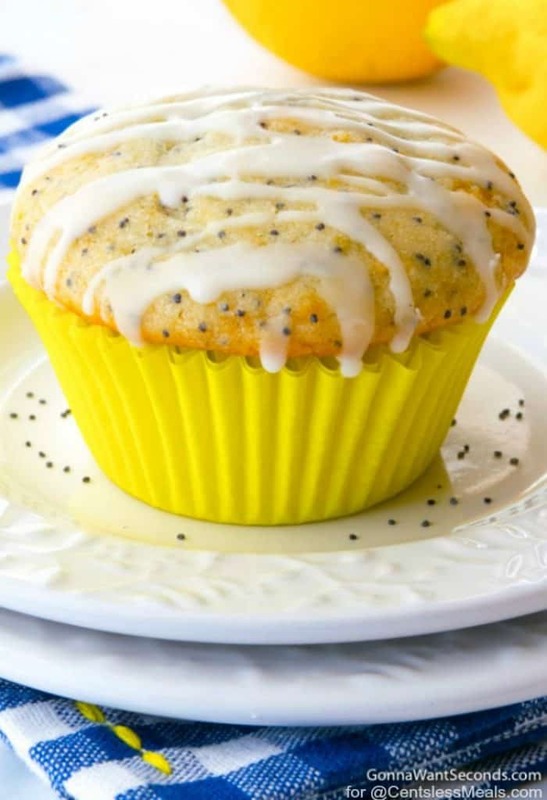 A good Lemon Poppy Seed Muffin recipe really needs to bring the lemon! Mine has both lemon juice and lemon zest in the batter. I also use buttermilk instead of regular milk, which adds even more tanginess, plus helps break down the proteins in the flour a bit to ensure a really tender muffin. The glaze on top is a simple lemon juice/powdered sugar combo, but it hits your tongue in all the right ways to produce a little pucker when you take a bite. Dense, lemony muffin magic is the only way to describe these babies, and you should skip right into your kitchen and make them! Unless, of course, you’re feeling more like a mixed fruit kinda dessert. 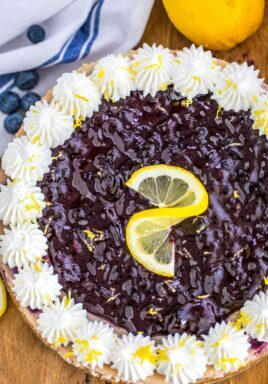 If thats what you’re hankering for then our Lemon Blueberry Dump Cake is just the ticket! But wait, maybe it’s a cool creamy direction you feel like going for. Have no fear, our Creamy Lemon Pie will happily take right where you want to go my friend! These easy to make Lemon Poppy Seed Muffins bake up moist and tender and are drizzle with a lovely lemon glaze. Preheat oven to 400 degrees F. Line 12 standard muffin tins with paper liners. In a large mixing bowl, whisk together flour, sugar, salt, baking powder, baking soda and poppy seeds; Set aside. In a medium mixing bowl, stir together the vegetable oil, lemon juice, lemon zest, egg, vanilla and buttermilk. Stir into the flour mixture until just combined (do not over mix). Allow batter to sit for 5 minutes. Spoon batter into prepared baking tin. Bake 15 minutes then lower the oven temperature to 325 degrees and continue to bake 10 minutes, or until golden brown and a toothpick inserted in the center comes out clean. Allow muffins to cool in pan for 10 minutes before removing them to a wire rack. Meanwhile, make the glaze. Whisk 2 tablespoons of the lemon juice with powdered sugar in a small bowl. 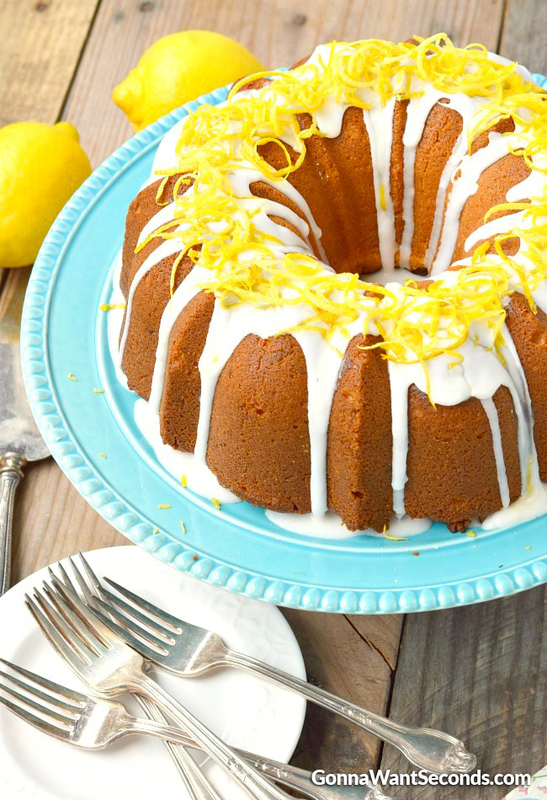 Slow add just enough lemon juice to thin the glaze to a thick, but pourable consistency. Use a fork to drizzle muffin tops with glaze. Serve! In the recipe Lemon Poppy Seed Muffins it says to lower the oven temp after baking for 15 minutes. Lower temperature to what? Thanks. Waiting for the answer so I can get baking these muffins. Lower the oven to 325. Thank you Katheryn!